It's time for evening meals in Ree Drummond's 16-minute frontier fast lane! First up are speedy Shrimp Tacos with slaw and fixings, then Pork Chops with Wine and Garlic comes with a side of zesty Lemony Green Beans. There's Pepperoni Chicken, unbeatable for dinner in a dash, and for a snappy solo supper, Crispy Grilled Cheese takes her to sandwich heaven. 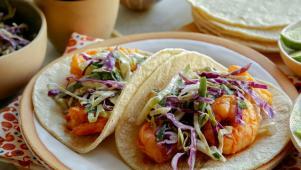 Ree fries up seasoned shrimp and makes a creamy slaw for her Shrimp Tacos.